California’s public higher education system consists of the University of California (UC), California State University (CSU), California Community Colleges (CCC), Hastings College of the Law (Hastings), and the California Student Aid Commission (CSAC). The Governor’s budget provides $11.9 billion in General Fund support for higher education in 2013–14. This is $1.4 billion (13 percent) more than the revised current–year level. After making adjustments for enrollment and accounting changes that otherwise would distort year–to–year comparisons, programmatic per–student funding increases 4 percent at UC, 7 percent at CSU, and 10 percent at CCC. Governor Has Major Concerns About Higher Education in California. Most notably, the Governor is concerned about a higher education cost structure that “continually increases without necessarily adding productivity or value.” He contends that neither the state’s taxpayers nor students can continue to sustain the current system. The Governor also notes that current funding approaches—historically based solely on enrollment—reinforce the high–cost delivery model and do not focus attention on student success and efficiency. Additionally, he asserts that many students cannot get into the high–demand courses they need to meet graduation requirements, resulting in their taking unnecessary units to remain enrolled and longer to graduate. The Governor further calls attention to low graduation and transfer rates. Data Generally Support Governor’s Claims. The traditional higher education delivery model— based on a faculty member with an advanced degree teaching a relatively small number of students in a physical setting—is high cost relative to other potential higher education and industry models. These high labor and facility costs are even greater at institutions that focus heavily on research. Costs in California are particularly high given a greater share of its public university students attend institutions with very high research activity. Moreover, average spending per student at UC is more than 20 percent higher than other universities with very high research activity. Data also suggest excess unit–taking is an issue at CCC and CSU. For example, in 2011–12, CCC provided instruction to nearly 95,000 students who already had earned 90 or more degree–applicable units—one academic year beyond that typically required for an associate degree or transfer. Graduation rates also are low at CCC and CSU, with only 23 percent of full–time CCC students graduating or transferring within three years and fewer than half of CSU students graduating within six years. Multifaceted, Multiyear Budget Plan. In response to these issues, the Governor proposes a multiyear budget plan. The main component of the plan is annual unallocated base General Fund increases for the universities, with similar increases in Proposition 98 funding expected for the community colleges. The Governor loosely links these base increases with an expectation the segments improve their performance but does not link them to enrollment expectations. The Governor’s plan also provides the universities with more autonomy in funding debt service, changes how the state funds retirement costs at CSU, changes how the state funds CCC, earmarks funding for several technology–related initiatives, freezes tuition levels, caps the number of state–subsidized college units, and modifies two CCC financial aid policies. Justification for More Funding and Less Legislative Involvement Unclear. Although we believe the Governor’s budget plan has drawn attention to some notable problems, we have serious concerns with several of his specific budget proposals. Most notably, by providing the segments with large unallocated increases only vaguely connected to undefined performance expectations, the Governor cedes substantial state responsibilities to the segments and takes key higher education decisions out of the Legislature’s control. We recommend the Legislature reject the Governor’s proposals relating to unallocated base increases, combining the universities’ capital and support budgets, allowing the universities to restructure their debt, and eliminating enrollment targets. Instead, we recommend the Legislature allocate any new funding first to meet the state’s highest existing priorities, including debt service, employee pension costs, and paying down community college deferrals. If more funding is provided than needed to meet these existing funding obligations, we recommend the Legislature link the additional funding with explicit enrollment and performance expectations. Extended Tuition Freeze Likely Would Have Negative Long–and Near–Term Consequences. We also have serious concerns with the Governor’s extended tuition freeze proposal, as it very likely would result in steep tuition increases during the next economic downturn and reduced accountability in the near term. Moreover, tuition levels and students’ share of cost currently are low. After accounting for state and institutional financial aid, the average share of cost paid by California students is about 30 percent at UC and CSU and 6 percent at CCC. Some Problems Likely Addressed by Redistributing Rather Than Increasing Funding. In some cases, we think the Governor’s basic ideas are worthwhile but likely could be implemented within existing resources. For example, increasing the availability of required courses while reducing the amount of excess course–taking could be done within existing resources. Likewise, the segments could leverage an existing repository of online courses developed by faculty and enable students to more easily access those courses largely, if not entirely, within existing resources. Higher Education Funding Models Up for Redesign. We also think revisiting the ways the state allocates funding to the segments is worthwhile, but we again have concerns with the Governor’s specific proposals. The Governor’s approach for the universities appears to fund neither student access nor success whereas his approach for the community colleges focuses only on one poor measure of student success. We envision a better funding model that balances the state’s dual goals of access and success. Under a redesigned system, instead of basing funding entirely on enrollment or on vague performance expectations, the Legislature would establish clear expectations in areas such as program completions, degrees earned, research activity, and cost reductions. In this report, we (1) provide a high–level overview of the Governor’s 2013–14 higher education budget, (2) examine the Governor‘s concerns about California’s public higher education system, (3) discuss the various components of the Governor’s multiyear budget plan for higher education, and (4) provide an assessment of and alternatives to the Governor’s plan. We discuss various other issues relating to the community colleges, including adult education restructuring, Proposition 39 energy efficiency projects, and payment deferrals in a companion report, The 2013–14 Budget: Proposition 98 Education Analysis. Governor Proposes $1.4 Billion in Additional General Fund Support for Higher Education. California’s publicly funded higher education system consists of the UC, CSU, CCC, Hastings, and CSAC. As shown in Figure 1, the Governor’s budget provides $11.9 billion in General Fund support for higher education in 2013–14. This is $1.4 billion (13 percent) more than the revised current–year level. As shown in Figure 2, the bulk of the new funding is for adult education restructuring, base increases at the universities, and a general purpose increase for the community colleges. A portion of the total ongoing General Fund increase is linked with provisions in the 2012–13 budget package that provided $125 million each to UC and CSU if they did not raise student tuition levels. aFor UC, CSU, and Hastings College of the Law, amounts include general obligation bond debt service in each year. For CCC, amounts include general obligation bond debt service and funding for the CCC Chancellor’s Office. For the California Student Aid Commission, amounts include federal Temporary Assistance for Needy Families and the Student Loan Operating Fund support that directly offsets General Fund costs. aExcludes transfer of $401 million in general obligation bond debt service funding to UC, CSU, and Hastings College of the Law since this has no immediate programmatic effect on the universities and does not increase overall state spending. Total Core Funding for Higher Education Would Increase $1.2 Billion. Figure 3 offers a broader perspective on higher education funding in that it shows both General Fund support and support from other core funding sources, including student tuition revenue, federal funds, and local property taxes (for the community colleges). In 2013–14, higher education would receive $18.4 billion in total core funding—reflecting a year–to–year increase of 7 percent. aReflects tuition after discounts provided through institutional financial aid programs. bIncludes general obligation bond debt service for UC, CSU, and Hastings College of the Law. cBeginning in 2012–13, health benefit costs for CSU retired annuitants are included in CSU General Fund. dHastings College of the Law receives about $200,000 in lottery funds. eDoes not include UC and CSU tuition paid from the General Fund for Cal Grant awards. Programmatic Funding Per Student Would Increase at All Higher Education Segments. Figure 4 shows another perspective on higher education funding—one that adjusts for enrollment levels and any accounting changes (such as payment deferrals) that otherwise would distort year–to–year programmatic comparisons. This figure focuses on the amount of funding generally available to support operational costs. As shown in Figure 4, increases in programmatic per–student funding range from 4 percent at UC to 10 percent at CCC. aExcludes lottery, general obligation bond debt service, and California State Teachers’ Retirement System costs. Includes other General Fund, net tuition and fees, other university core funds, federal Education Jobs Act funds, and local property taxes. bFor 2013–14, the Governor’s budget provides CCC with additional programmatic funding without assuming any increase in the system’s funded enrollment level. To the extent that CCC’s enrollment target is adjusted commensurate with any base increase, programmatic per–student funding will be lower. Package Includes Funding Increases for State’s Financial Aid Programs. The Governor’s budget includes Cal Grant funding increases of $60 million in the current year and an additional $100 million in 2013–14. The increased costs result from growth in student participation in the program and shifts in the types of awards for which students qualify (with more students qualifying for grants that cover both tuition and a portion of living costs). Figure 5 shows the number of Cal Grant recipients and total award amounts by segment. High–Cost Delivery Model Is Not Sustainable. The Governor describes a higher education cost structure that “continually increases without necessarily adding productivity or value.” He contends that neither the state’s taxpayers nor students and their families can continue to sustain higher education institutions under the current model. Universities’ Budget Plans Assume Continued Growth in Costs. The Governor points out that the UC Regents’ and CSU Trustees’ budget plans are predicated on the current high–cost model. They assume continued growth in funding at levels far exceeding projected growth in state revenues and personal income. The Governor deems such plans unrealistic and instead urges the segments to reduce instructional costs, decrease time to degree, and increase graduation rates. Enrollment–Based Funding Does Not Promote Innovation and Improvement. The Governor notes that current funding approaches—historically based on enrollment—reinforce the high–cost delivery model and do not focus attention on important outcomes such as student success and efficiency. Unavailability of Required Courses Increases Total Costs for State and Students. The Governor asserts that the high–demand courses many students need to meet graduation requirements often are unavailable. As a result, the Governor argues many students take unnecessary units to remain enrolled and take longer to graduate. These factors increase costs for both the state and students. Student Outcomes Generally Are Poor. Calling attention to low graduation and transfer rates, the Governor argues that poor student outcomes lead to even greater inefficiencies in the higher education system. Rapid Tuition Increases Have Been a Hardship for Some Families. The Governor also notes that recent tuition increases have been difficult for some families that do not qualify for financial aid. At the same time, he acknowledges that despite these tuition increases California has some of the lowest fees in the country. He also points out that the state’s financial aid programs are among the nation’s most generous. As a result of low tuition and high aid levels, the Governor concludes that public postsecondary education remains relatively affordable for California families. Available data support many of the claims the Governor makes about higher education. For a few of his claims, however, the data are less compelling. Traditional Delivery Model Is High Cost. The traditional higher education delivery model has a few basic attributes that result in high costs relative to other potential higher education models as well as other industry models. Most importantly, the model is based on a faculty member with an advanced degree teaching a relatively small number of students in a physical setting. These high labor and facility costs are even greater at institutions that focus heavily on research. This is because faculty at these institutions tend to have a lower teaching load compared to institutions that focus less on research. Universities with a very high research focus also have relatively expensive facilities given the additional need for laboratories and state–of–the–art technology. Another factor that contributes to high costs is the very common practice of measuring educational attainment by the amount of time a student spends in school (usually the equivalent of at least four years for a bachelor’s degree and at least two years for an associate degree). This focus on time in school rather than more refined measures of learning perpetuates the traditional higher education cost structure. University Costs in California Are Particularly High. Not only is the traditional higher education delivery model high cost, but data suggest that costs are particularly high in California. One reason is that a greater share of California’s public university students attend institutions with very high research activity (which tend to be more expensive than other universities). While one–third of university students attend such institutions nationally, 40 percent of California’s university students do. In addition, average spending per student at these UC universities is more than 20 percent higher than at their national counterparts. Several factors could result in higher costs, including lower faculty workload expectations, a more science–oriented mix of academic programs, and high compensation. Universities’ Budget Plans Predicated on State Maintaining High–Cost Delivery Model. In developing their own budget plans, the segments have included various components related to the high–cost delivery model, including proposed increases in compensation, employee benefit costs, and infrastructure needs. In addition, the universities’ plans propose to reverse some recent budget reductions, for example by reducing student–faculty ratios. Overall, UC’s and CSU’s own budget plans reflect core spending increases of 8 percent and 11 percent, respectively, from the current year. Because both plans assume the state General Fund rather than tuition will cover the entirety of these spending increases, projected increases in state funding are higher—12 percent and 18 percent, respectively. As the Governor points out, these increases are very high relative to the projected 4.5 percent increase in state revenues. Many Students Accrue More Course Units Than Required for Graduation. Higher education costs also are driven up by excess unit–taking. Standard course requirements for graduation generally total 60 semester units (or 90 quarter units) for an associate degree and 120 semester units (or 180 quarter units) for a bachelor’s degree. Students who accrue units in excess of these requirements generally take longer to graduate, increase state and student costs, and crowd out other students. Excess unit–taking is most prevalent at CCC and CSU. In 2011–12, CCC provided instruction to more than 350,000 students who already had earned 60 or more degree–applicable semester units. Of these students, nearly 95,000 had earned more than 90 units. At CSU, about 90,000 students already had accrued 120 semester units before starting the current academic year. Of these students, about 13,000 had accrued at least 150 units and 2,000 had accrued at least 180 units. Causes of Excess Unit–Taking Are Varied. Several factors contribute to excess unit–taking. Some of these involve choices students make, either intentionally or because they lack adequate information. Others are related to campus decisions. Unfortunately, due to data limitations, it is not possible to determine the share of excess unit–taking caused by each of these factors. Some Students Choose to Take Extra Courses. Some students choose to take courses that are not required for their majors because of interest in the subject or to make themselves more marketable to employers or graduate schools. Others change majors a number of times, repeat courses several times to improve their grades, or remain in school for other reasons after meeting degree requirements. Unavailability of Courses Also Has a Role. Students who cannot get into their required courses (due to oversubscribed courses or student scheduling constraints) sometimes substitute other, nonrequired courses to remain eligible for student financial aid, insurance, and other student benefits. As they enroll in substitute courses, these students crowd out others who may need the courses to meet degree requirements. Institutional Policies Limit Applicability of Some Units. Course articulation decisions made at the campus or department level also may result in a student accruing excess units. For example, transfer students may find that some of their community college courses are not accepted toward degree requirements by the receiving university. Graduation Rates in California Tell Mixed Story. Student outcomes vary among California’s public higher education segments. (Outcomes also vary significantly among institutions within each segment.) This variation is due in part to the pools of students from which the three segments draw. Currently, the top one–eighth of all graduating high school students are eligible for admission to UC, the top one–third are eligible for admission to CSU, and all persons 18 years or older are eligible to attend CCC. As Figure 6 shows, more than 80 percent of UC students graduate within six years, compared with 47 percent of CSU students. Only 23 percent of CCC students graduate or transfer within three years. These official graduation rates, reported by the U.S. Department of Education, reflect the share of first–time, full–time freshmen who graduate within 150 percent of the normal time needed to complete all program requirements. The graduation rate does not reflect student success broadly at CCC because only a small fraction of CCC students enter as full–time freshmen and some students may not be seeking degrees. Even considering these caveats, graduation rates at CCC are disconcertingly low. Figure 6 also shows that low graduation rates are a national problem, not only a California problem. 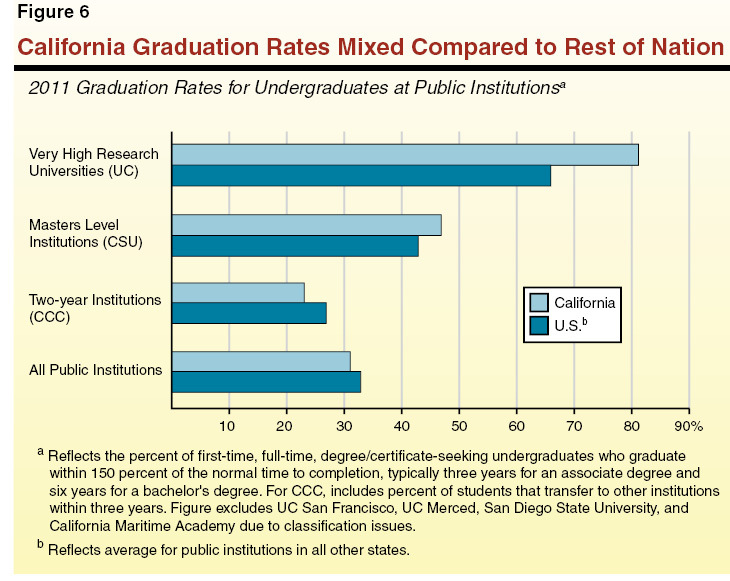 In fact, graduation rates at UC and CSU are better than the rates for comparable institutions nationally, but the CCC rate is lower than the average of two–year public institutions in all other states. Tuition and Fee Levels in California Are Relatively Low. In addition to focusing on higher education costs and student outcomes, the Governor makes certain claims about tuition and fees in California. Although tuition and fee rates have nearly doubled since 2007–08 at UC and CSU—and more than doubled at CCC—these rates remain comparatively low. The per–unit fee ($46) at the CCC is lowest among the 50 states, undergraduate tuition at CSU ($5,472) is lowest among its 15 public university peers, and undergraduate tuition at UC ($12,192) is slightly above the average of its four comparison public research universities. California’s Financial Aid Programs Keep College Education Affordable for Financially Needy Students. About half of the students currently enrolled in public colleges and universities receive need–based financial aid specifically to cover full tuition and fee costs. These financial aid awards increase dollar–for–dollar as tuition and fees increase. As a result, spending for both Cal Grants and institutional financial aid has doubled since 2007–08 while the amount actually paid by families has increased far less. With Low Fees and High Aid, Net Price Has Not Increased Much for Lower Income and Many Middle–Income Families. Figure 7 shows the increase in average net price for families at various income levels from 2008–09 to 2010–11. (Average net price is the total cost of attendance—including tuition, room and board, and other expenses—after subtracting government and institutional grants and scholarships. It is only reported for families receiving federal student aid, including student loans.) While tuition and fees increased between 30 percent and 45 percent during this period, average net price increased 4 percent or less for most families at the universities and 6 percent at the community colleges. For UC students with family income above $110,000 and CSU students with family income above $75,000, net price increased more significantly. Though they are less likely to qualify for need–based aid, these families may receive other types of federal assistance to help cover education costs, including tax credits, tax deductions, and student loans. Nonetheless, families with these higher income levels typically are more likely to bear the costs of tuition increases. aTotal cost of attendance is the sum of published tuition, required fees, books, supplies, room and board, and other expenses. Average net price is generated by subtracting the average amount of federal, state, local, and institutional grant aid from the total cost of attendance. The figure excludes students who did not apply for or receive federal student loans, grants, or work study. bThe proportion of CCC students with family income above $30,000 that complete the federal financial aid application is very small. Student Debt Also Relatively Low. Another result of low fees and high aid is that average student loan borrowing is relatively low for California students. Recent data show that in 2010–11, about half of graduates from California’s public universities had student loan debt, and the average debt for these students was $16,840. (This is lower than the amount cited in the Governor’s budget, which includes graduates of nonpublic institutions.) By comparison, the average debt for public university graduates nationally—57 percent of whom had student loans—was more than $23,000. As part of his overall approach to addressing these issues, the Governor proposes a multiyear higher education budget plan. The plan includes annual unallocated base increases for each segment. The Governor links these base increases with an expectation the segments improve their performance in certain areas. The Governor’s plan also makes changes in the funding of debt service at the universities and retirement costs at CSU. The plan includes no enrollment targets for the universities but does include a proposal to change how funding is allocated to the community colleges. The Governor’s plan also earmarks funding for several technology–related initiatives. In addition, his plan includes proposals to freeze tuition levels, cap the number of state–subsidized units, and change two CCC financial aid policies. Below, we describe each of these proposals. In the next section, we evaluate them and, in many cases, offer alternatives. Proposes Annual Unallocated Base Increases. The main funding component of the Governor’s multiyear higher education budget plan is annual unallocated base General Fund increases for each of the higher education segments over the next four years (2013–14 through 2016–17). For 2013–14, the Governor provides 5 percent base increases of $125 million each for UC and CSU and nearly $200 million for CCC. (The 5 percent base increases for the universities are identical because he bases them both on UC’s budget.) University funding would increase by an additional 5 percent in 2014–15 and 4 percent in each of the following two fiscal years. The Governor also expects CCC funding to grow “significantly” over the next several years. Desires Better Student Outcomes. The Governor links his proposed base increases with the segments’ success in achieving certain objectives, including improving graduation rates at all segments, increasing the CCC transfer rate, and improving credit and basic skills course completion. To help achieve these objectives, the Governor expects the segments to implement certain strategies, including increasing the availability of courses, using technology to deliver quality education to greater numbers of students in high–demand courses, improving course management and planning, using faculty more effectively, and increasing use of summer sessions. Combines Funding for Capital and Support Budgets . . . The Governor also proposes to shift a total of about $400 million in general obligation bond debt service for UC, CSU, and Hastings to the segments’ support budgets. Each segment would receive the amount associated with 2013–14 general obligation debt service payments for its capital projects: $201 million for UC, $198 million for CSU, and $1 million for Hastings. Since these funds already were being accounted for in a separate appropriation, the shift does not increase state costs. The Governor also proposes to remove current restrictions specifying how much of the universities’ support budgets are to be used to repay state lease–revenue debt. To ensure that state debt for all projects continues to be repaid, however, the State Controller would automatically transfer the appropriate amounts out of the universities’ budgets each year.
. . . And Removes Legislative Prerogative in Capital Projects Moving Forward. Under the proposal, Department of Finance (DOF) would continue to review and approve capital projects for the universities, but the Legislature would no longer be involved in making these decisions. Projects using state funds would be limited to academic facilities needed for safety, enrollment growth or modernization purposes, as well as infrastructure projects that support academic programs. Though the administration indicates the universities potentially still could request state bond funding for their projects, the Governor also proposes to allow them to pledge General Fund monies to issue their own debt for capital projects. Allows Universities to Restructure State Bond Debt. The Governor further proposes to allow UC and CSU to restructure existing state lease–revenue debt related to their projects. For example, the state currently has about $2.5 billion in outstanding lease–revenue debt for projects built at UC. In 2013–14, the state will spend about $221 million to service this debt. Under the Governor’s proposal, UC would be granted the authority to repay the state’s bondholders the $2.5 billion owed to them by issuing its own bonds on its own terms. Limits Future Budget Adjustments for CSU Retirement Costs. Under state law, CSU is required to participate in the California Public Employees’ Retirement System (CalPERS). The university system’s annual contribution to CalPERS is determined by multiplying its payroll costs by its employer contribution rate. In 2012–13, for example, CSU had an estimated $2.2 billion in payroll subject to CalPERS, an employer contribution rate of 21 percent (for most of its payroll), and a resulting CalPERS contribution of $463 million. Each year, the state adjusts CSU’s budget (as it does for other state departments) to account for changes in retirement costs due to changes in payroll and employer rates. Starting in 2013–14, the Governor proposes that future adjustments to CSU’s budget for retirement costs be based permanently on 2012–13 payroll costs. According to the administration, this would require CSU to consider full compensation costs for any decision to increase its payroll. Does Not Include Enrollment Targets for Universities. Figure 8 shows enrollment levels for each of the segments, as reflected in the Governor’s budget, though the administration indicates the information is only for display purposes. Unlike historical budget practice, the administration indicates that it will not set enrollment targets for UC and CSU as part of the multiyear plan. The Governor also does not link any of the annual base augmentations to specified enrollment growth. The administration indicates the universities would have full discretion in determining how many students to serve, including how many additional students, if any, to serve. The Governor proposes to continue to fund community college districts based on enrollment (though he proposes to change the way enrollment is calculated, as discussed below). Despite keeping current–year CCC base funding linked with enrollment, the Governor does not require the community colleges to serve additional students in the budget year with his proposed base augmentation. aOne full–time equivalent student represents 30 credit units for an undergraduate at UC and CSU, 24 credit units for an undergraduate at CCC, and 24 credits units for graduate and law students. bIncludes general campus and health science students pursuing graduate academic and professional degrees. cIncludes students in doctoral, masters, and postbaccalaureate programs other than teacher credential. dFor each year, reflects funded enrollment levels for CCC. Bases CCC Funding on Course Completions Rather Than Enrollment. The Governor also proposes to change the basis on which community college districts are funded for credit instruction. Currently, the amount of funding a district receives depends largely on the number of students enrolled at “census”—a point defined in CCC regulations as one–fifth into a given academic term (typically the third or fourth week of the semester). If a student drops a course after this date, the college still earns full payment for that student. Beginning in 2013–14, the Governor proposes to add a second CCC census date at the end of each term. Over a five–year period, there would be a gradual shift in the relative weight of these census dates for purposes of calculating district enrollment. By 2017–18, community colleges would be funded exclusively on the number of students still enrolled in their courses at the end of each term. According to DOF, any reduction in a district’s enrollment (apportionment) monies resulting from this policy change would be automatically redirected to that district’s Student Success and Support categorical program, which funds assessment and counseling services. Districts that do not show improvement in course completions after a certain period of time (as defined by the Board of Governors [BOG]) would have this redirected funding swept and reallocated to other colleges. According to the Governor, the purpose of his proposal is to “more appropriately apportion funding by focusing on completion” as well as to provide community colleges with incentives to ensure appropriate student placement and good course management. Earmarks Funding for Several Online Education and Technology Initiatives. The Governor earmarks $10 million each for UC and CSU to expand the availability of courses through the use of technology. Budget bill language specifies that the funding is for high–demand courses that fill quickly and are required for many different degrees. Under the Governor’s plan, UC and CSU would have discretion in allocating funds within their systems but would be required to prioritize development of new courses that can serve greater numbers of students while providing equal or better learning experiences. The Governor also proposes a new $16.9 million CCC categorical program, a portion of which would be used for a similar online initiative to increase the availability of high–demand courses. The CCC Chancellor’s Office would be required to submit an associated allocation plan to the DOF for approval. The Governor proposes that CCC use some of the remaining increase to purchase a common learning management software system and the rest to expand opportunities for students to earn course credit by examination. Proposes No Tuition and Fee Increases Over Extended Period. Figure 9 shows tuition and fee levels at each of the segments. The Governor expects the universities to maintain current tuition and fee levels for the next four years. As a result, tuition and fee levels would remain flat for a six–year period (2011–12 through 2016–17). For the community colleges, the Governor also proposes no fee increase in 2013–14 but DOF indicates the administration is silent as to potential fee increases in the future. aReflects range for students in business, law, medicine, nursing, and other professional programs. bReflects average for undergraduates. Campus fees for graduate and professional students are somewhat lower. cGraduate fees also apply to postbaccalaureate programs other than teacher credential programs. dIncludes professional doctorates in education, nursing, and physical therapy. Places Cap on State–Supported Units. The Governor proposes placing a limit on the number of units the state would subsidize per student. Under the proposal, students taking units in excess of the cap generally would be required to pay the full cost of instruction. For 2013–14 and 2014–15, the Governor proposes a cap of 150 percent of the standard units needed to complete most degrees at UC and CSU. (The 150 percent cap equates to 270 quarter–units at UC and 180 semester–units at CSU.) Thereafter, the Governor proposes a cap of 125 percent of the standard required units at UC and CSU—about one extra year of coursework. For the community colleges, the Governor proposes a cap of 90 semester–units beginning in 2013–14. This cap also equates to about one extra year of coursework beyond that required for transfer or an associate degree. For CCC students who transfer to UC or CSU as juniors, the proposed cap is 150 percent in the first two years and 125 percent beginning in 2015–16 of the additional units needed to meet the requirements for a bachelor’s degree. According to the Governor, the unit cap is intended to create an incentive for students to shorten their time to degree, reduce costs for students and the state, and increase access to more courses for other students. Proposes Two Changes to CCC Financial Aid Policies. Currently, many CCC students have a choice to apply for a BOG fee waiver using either the Free Application for Federal Student Aid (FAFSA) or a separate BOG fee waiver form. Beginning in 2013–14, the Governor proposes to require CCC students to use only the FAFSA. The purpose of the proposal is to ensure that all financially needy students gain access to the full spectrum of allowable federal and state aid—rather than being able only to access a CCC fee waiver. Requiring students to complete the FAFSA also would result in better information about students’ financial means, as the current process for many CCC financial aid applicants relies on self–certified information. The Governor’s second proposal is to require campuses to take both student and parent income into account when determining certain students’ eligibility for a BOG fee waiver. In this part of the report, we analyze the Governor’s specific higher education proposals. We group his proposals into three main sections. The first section focuses on several proposals relating to the Governor’s base funding increases for the three segments. The second section assesses the Governor’s three technology initiatives. The third section focuses on the Governor’s proposals relating to tuition, caps on state–subsidized units, and financial aid. By providing the segments with large unallocated increases not tied to specific requirements, the Governor cedes substantial state responsibilities to the segments and takes key higher education decisions out of the Legislature’s control. For example, the Governor defers to the segments the issue of how many students California’s public higher education system will serve. We believe this type of decision should be made through the annual state budget process. Given our concerns with the Governor’s overall budget approach for higher education, we recommend rejecting several of his proposals. Specifically, as discussed in more detail below, we recommend the Legislature reject the Governor’s proposals to: (1) provide the segments with unallocated base increases, (2) combine UC’s and CSU’s capital and support budgets, and (3) allow the universities to restructure their debt–service payments. In contrast to these proposals, we think the Governor’s proposal relating to CSU retirement costs has merit but are concerned with the absence of a proposal relating to UC retirement costs. Lastly, we think the Governor’s interest in rethinking how the state allocates funding to the community colleges also has merit, but we offer the Legislature an alternative that we think is much more likely to foster the state’s dual goals of providing student access and promoting student academic success. Given High Costs and Mixed Outcomes, Justification for More Funding Unclear. The Governor provides $427 million in unallocated base funding increases to the institutions, with only a vague connection to undefined performance expectations. (Including additional funding provided in exchange for not raising tuition last year, cumulative new unallocated funding for the segments is $677 million.) Why the state would invest more in a system that is high cost and has poor outcomes without requiring explicit improvement is unclear. Unallocated Increases Allow Segments to Pursue Own Interests Rather Than Broader Public Interests. For the universities, the Governor’s budget lumps virtually all of each segment’s funding into one pot and allows the segment to determine how best to spend the entire pot. For the community colleges, the Governor also provides an unallocated base augmentation linked neither to enrollment growth nor to any other identified public purpose. Rather than encouraging the segments to address state–identified problems and priorities, such an approach gives the segments much broader authority to pursue their top priorities. For example, the segments might decide to focus on more research, their law and medical schools, or administrative support, even if at the expense of broader public interests. Moreover, based on the segments’ own budget plans, the segments likely would use augmentations primarily for employee compensation. As a result, the augmentations would increase the cost per student. Given the almost complete removal of funding requirements and the associated weakening of the incentives segments have to focus on broader public interests, the Governor’s approach could end up exacerbating existing problems rather than improving the system. Some Problems Can Be Addressed by Redistributing Rather Than Increasing Funding. Furthermore, most of the Governor’s proposals involve substituting more efficient or effective activities for existing ones. For example, increasing the availability of required courses while reducing the amount of excess course–taking could be done within existing resources. Likewise, the segments could leverage an existing repository of online courses developed by faculty and enable students more easily to access those courses largely, if not entirely, within existing resources. As these examples illustrate, the segments likely could achieve many of the goals set forth by the Governor using funds the state already provides. If Additional Funding Provided, Use to Meet Highest Priorities. We recommend the Legislature reject the Governor’s unallocated base increases, as they would be very unlikely to promote systemic change. We also recommend the Legislature reject the Governor’s approach of providing equal dollar amounts to each university segment irrespective of its needs. Instead, we recommend the Legislature allocate any new funding to meet the state’s highest priorities. As a first priority, we recommend the state meet existing higher education obligations, including debt service, employee pension costs, and paying down community college deferrals. Set Specific Improvement Targets and Review Performance Annually. If more funding is provided than needed to meet these existing funding obligations, then we recommend the Legislature link the additional funding with an expectation that the segments develop and implement strategies to improve legislatively specified student outcomes and meet identified cost–containment goals. Broad consensus already exists on some key outcome goals, including improving student persistence, transfer, and graduation; reducing costs; and maintaining quality. Moreover, the Legislature last year passed legislation outlining a process that would enable the state to measure progress and promote improvement in these areas through budget and policy decisions. Building on this foundation, the Governor and Legislature could establish specific improvement targets and a system for reporting on the segments’ performance relative to these targets. We also recommend the Legislature establish enrollment targets for all three segments to ensure that student outcome improvements do not come at the expense of existing student access. These performance and enrollment targets would send a clear signal to the segments regarding the state’s priorities and expectations. Compared with unallocated increases of seemingly arbitrary amounts, this approach would be far more likely to result in improved performance of the higher education system. Legislature Would Lose Control of Key Budget Decisions. Not only does the Governor’s proposal not identify any benefits for the state, we find that the proposal has several serious drawbacks. Most troubling, the Governor’s approach is predicated on the Legislature relinquishing its role in capital decisions for the universities. That is, the Governor takes the Legislature out of the business of approving state buildings at the universities and gives it no role in determining the shares of higher education funding to be used for infrastructure and operations. As a result, the Legislature would have less oversight over the segments’ use of state funds and the segments would have even greater incentive to pursue their own institutional interests, instead of those benefiting the state more broadly. In addition, the Governor’s proposal would make planning for infrastructure spending statewide more difficult, as the state would not be able to prioritize funding as easily among the segments and/or other program areas. Funding Provided Under Proposal Not Linked With Any Assessment of Ongoing Needs. Another concern with the Governor’s proposal relates to the amount of funding he plans to provide the segments for their ongoing infrastructure needs. Specifically, the proposal presumes the amount of debt service funding related to one fiscal year (2013–14) is an appropriate amount upon which to base ongoing needs yet offers no evidence to this effect. It may be, for instance, that the current debt service amounts are too high. As shown in Figure 10, the state’s total debt service costs (general obligation bonds and lease–revenue bonds) for UC, CSU, and Hastings have increased significantly over the last decade—growing from $434 million ten years ago to $711 million today (an increase of 64 percent). The Governor’s proposal nonetheless effectively rolls into each of the three segments’ base budget a relatively high point in debt service, without attempting to determine how this amount relates to the segments’ ongoing needs. Future Need for Infrastructure Spending Likely to Decrease. A related problem with the Governor’s proposal is that it does not take into account that the segments’ infrastructure needs likely will decrease significantly in the near future. One reason for this is demographic changes. The state projects that the 18 to 24 year–old population (the traditional college–age population at universities) will start to decline by about 1 percent annually starting in 2015. This means the segments may not require as many new buildings to accommodate enrollment as they have in past years when this age group was growing at a rapid pace. Moreover, the Governor’s proposal to change the delivery model for higher education would result in a significantly reduced need for infrastructure spending. In particular, moving more courses online and increasing summer sessions would reduce the demand for new, traditional facilities (as would other strategies that increased space utilization). Thus, even if the current debt service amounts were somehow reflective of the segments’ capital outlay needs at present, they could seriously overstate future needs. Recommend Rejecting Proposal to Combine Capital and Support Budgets. Given the lack of a compelling policy rationale for the proposal, along with the serious concerns regarding the loss of the Legislature’s ability to plan and oversee infrastructure projects, we recommend the Legislature reject the Governor’s proposal. If the Legislature is interested in developing a new process for funding the segments’ capital projects, then it would need to grapple with several fundamental issues. Most importantly, the Legislature would need to (1) identify the specific problems with the current capital outlay process and (2) develop a new method for allocating and overseeing funding that addresses these problems. As part of this process, if the Legislature did decide to combine capital and operational funding, then the Legislature would need to assess annual ongoing capital priorities, identify a reasonable initial amount to transfer, decide how to adjust that amount moving forward, and decide whether the segments should be able to pledge their state appropriations to issue debt. Without addressing such fundamental issues, we think moving to a new process as proposed by the Governor is premature. UC’s Proposal Would Increase Future Costs Significantly in Exchange for Relatively Minor Short–Term Savings . . . In response to the Governor’s proposal to allow the universities to restructure state infrastructure–related debt, UC has developed one potential restructuring plan. (The CSU has not yet presented a proposal.) Under UC’s plan, it would restructure the existing lease–revenue debt over a 40–year period. Under the state’s current repayment schedule, this debt would be retired fully in half that time. Because the university would extend the repayment period so far into the future, UC estimates it could lower the annual debt service payment by about $80 million in the short term. After ten years, however, the university would begin paying a few million dollars more in debt service annually than under the current repayment schedule. This difference would increase significantly in later years, such that, over the life of the restructured debt, UC estimates it would pay an additional $2.1 billion. In today’s dollars, this means the restructuring would cost nearly $400 million.
. . . Which Could Make Investing in UC Facilities More Difficult in the Future. The university asserts that extending the repayment term to 40 years matches the life span of the buildings built with the bonds. By pushing debt out to years in which there otherwise would be no debt service, this approach, however, risks making investments in future facilities more difficult. For example, the university may have difficulty undertaking as many new capital projects 30 years from now as it otherwise could because it still would be paying off debt issued over 30 years earlier. (Though the demographic projections and policy proposals discussed earlier could mitigate the need for facilities in the near term, making similar judgments about facility needs several decades from now is more difficult.) Faced with such a situation, the university likely would have to (1) forgo capital projects it otherwise would have undertaken, (2) redirect funding that otherwise would have gone to support instruction or research, (3) seek additional funding from the state, and/or (4) increase student tuition. Recommend Rejecting Restructuring Proposal. Given that restructuring debt would cost more money in the long term and constrain future budget choices, we recommend the Legislature reject the Governor’s debt restructuring proposal for the universities. If the Legislature is concerned that the universities would lose the short–term savings associated with the debt restructuring, it could consider other strategies for the universities to increase revenue or reduce costs. Proposal for CSU Provides Some Benefits, Recommend Adopting. The Governor’s proposal to modify the way the state budgets for CSU retirement costs offers some minor benefits. Specifically, the proposal would provide an incentive for the university to consider retirement costs in its hiring decisions. Right now, the university likely ignores these costs since they are automatically covered by the state. Because the university no longer would receive automatic budget adjustments above the current payroll level, the Governor’s approach would incentivize CSU to be more cautious in its hiring and use its existing resources more efficiently. This could reduce both payroll costs and future retirement costs. At the same time, the proposal reasonably allows for future budget adjustments related to the university’s existing payroll to account for rate changes made by CalPERS. For these reasons, we recommend the Legislature adopt the proposal. Three Budget–Year Considerations Related to UC Retirement Costs. In deciding how best to address UC’s retirement costs, we think the Legislature has three main issues to keep in mind. Cost Control. One major issue is that UC, unlike other state agencies, administers its own retirement plan. This means that UC determines its contribution rates, employee benefits, and investment options—all of which affect the plan’s costs. Given this, the state needs to assess UC’s retirement costs and benefits to ensure they are reasonable. For example, at the moment, UC employees contribute less to their pension plan than most state workers. Both the state and UC, however, have been undertaking many changes in their retirement programs and phase–in issues are making comparison of the two programs somewhat more difficult. 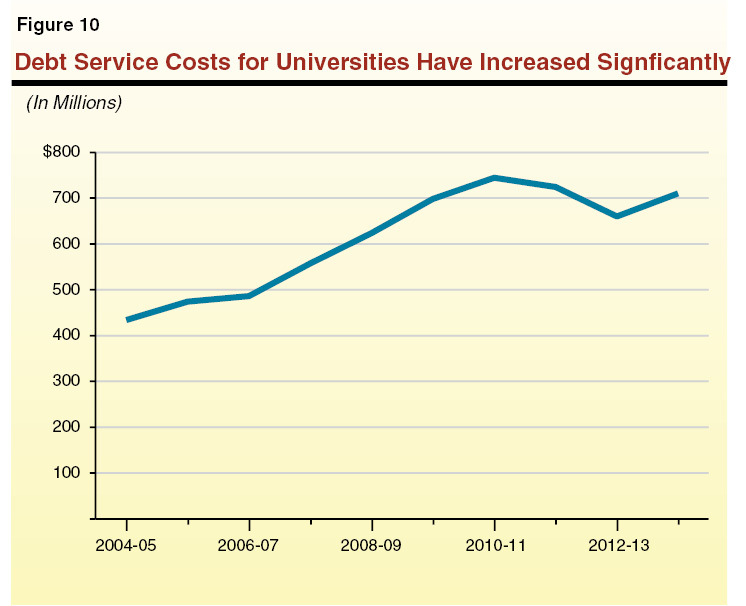 Our best assessment today is that UC’s increased costs in 2013–14 appear reasonable. Payment Obligation. The state is not legally obligated to provide funding for the university’s retirement costs. Nevertheless, current retirement costs are largely unavoidable obligations for the university. Not addressing them means the university would incur significantly greater costs in the future. Addressing them without state funding means the university would have to cover the costs in some other way—such as by redirecting from its instructional program or increasing student tuition. Transparency. The Governor’s approach to provide UC with a base augmentation but not designate any of it specifically for retirement costs lacks transparency. For other state agencies, the state typically makes a baseline funding adjustment to cover retirement costs. This makes identifying how much funding is going toward this purpose possible and provides clarity for both the agency and the state. For UC, identifying retirement costs would show how much of its base augmentation is available for this and other purposes. For the state, identifying retirement costs would prevent the university from asserting in the future that it did not receive funding for this purpose. Recommend Designating $67 Million for UC Retirement. For these reasons, we recommend the Legislature specify $67 million of UC’s proposed 2013–14 base budget increase for pension costs. (For Hastings, we recommend the Legislature increase the Governor’s proposed base augmentation from $392,000 to $455,000 and designate the full amount for retirement.) In addition, consistent with the approach taken by the state in 2012–13, we recommend the Legislature include language in the budget reiterating that the state is not obligated to provide any additional funding for this purpose moving forward. Such language is intended to reinforce that the state is not liable for these costs. Future Considerations for Universities’ Retirement Costs. The Legislature recently enacted pension–related legislation that could significantly reduce long–term retirement costs for nearly all public employers. In the future, the Legislature may want to consider the universities’ retirement costs in light of this legislation. This consideration would be useful since UC was specifically exempt from the legislation, while the applicability of some provisions to CSU is still being determined. In the future, the Legislature could consider providing the universities with funding for retirement costs comparable with costs incurred by other public employers. Under this approach, the universities would be responsible for any costs beyond that level. Alternatively, the Legislature could consider encouraging the universities to change their retirement plans to conform with other public employers by linking such changes with their state appropriation. Current Funding Model Pays CCC for Providing Student Access, Not Promoting Success. Like any other organization, the way community colleges are funded drives their priorities and behavior. Because they are funded on enrollment at census, a top priority of the colleges is to ensure enough students are enrolled early in the term to meet their enrollment targets. While funding community colleges this way creates a positive incentive for colleges to provide students with access to instruction, the funding approach has been criticized for not creating a strong incentive for colleges to help students fulfill their broader academic objectives. For example, some community colleges have acknowledged that they have been reluctant to require new students to participate in assessment and orientation—support services that are strongly correlated with student success—for fear of “turning off” potential students. As a result, students may enroll in courses for which they are academically unprepared and have little chance of successfully completing. The need to meet enrollment targets also can create an incentive for colleges to offer popular instruction that “fills seats” but is primarily recreational in nature and outside of CCC’s core educational mission. Legislature Has Shown Interest in New Funding Approaches That Improve Incentives. In recent years, the Legislature has expressed interest in modifying CCC’s funding model to address these issues. During the 2009–10 legislative session, AB 2542 (Conway) would have created a voluntary pilot program allowing up to five community colleges to be funded based on the number of students who successfully completed their courses (with bonus payments for increasing student graduations) rather than the traditional census method. Also during the 2009–10 legislative session, SB 1143 (Liu) sought to base CCC funding in part on successful course completions. After its passage in the Senate, this bill was amended to require the BOG to convene a task force to study “alternative funding options” and other strategies designed to improve student success at the community colleges. The legislation was signed by the Governor in fall 2010. CCC Task Force Recommends Ongoing Study of Outcome–Based Options. In response to the legislation, the BOG created the Student Success Task Force. The task force was comprised of 21 members from inside and outside the CCC system. After meeting for nearly one year, the task force released Advancing Student Success in California Community Colleges in December 2011. The report contains a number of recommendations, including creation of a common assessment test for new students and development of a “scorecard” that measures student success rates at each college. While members did not reach consensus on whether to endorse funding outcomes in the report, the task force recommended the CCC Chancellor’s Office “continue to monitor implementation of outcomes–based funding in other states and model how various formulas might work in California.” The BOG formally adopted the Student Success Task Force’s recommendations in January 2012.
. . . But Governor Misses Opportunity for More Meaningful Reform. Though funding course completions has some advantages over the current funding model, course completion is actually quite high at CCC—the systemwide average course retention is about 85 percent. Program completion, on the other hand, is low. According to the Institute for Higher Education Leadership and Policy, only about one–third of all CCC students seeking to transfer to a four–year institution or earn a certificate or associate degree actually do so. Whereas course retention is not a major problem, research has shown that students do tend to struggle to achieve other milestones on their educational path, such as returning the following year, completing their basic skills (remedial) sequences, passing transfer–level math and English courses, and reaching 30 units of college credit (one full academic year of coursework). By addressing only course retention, therefore, we believe the Governor is focused too narrowly on only one type of outcome—when instead the focus should be on several other more meaningful outcomes of student success. Funding Course Completions Could Create Perverse Incentives for CCC. In addition, we are concerned that, if implemented, the Governor’s proposed funding model could create perverse incentives for community colleges. While average course retention rates are 85 percent, rates vary considerably by discipline and program. For example, mathematics and economics courses tend to have lower retention rates than fine arts and sociology courses. If the CCC system were to be funded based on course completions, colleges would have a perverse incentive to de–emphasize core programs with relatively low retention rates and increase offerings of noncore programs (such as physical education) with relatively high retention rates. Moreover, the Governor’s budget seeks to create incentives for CCC to offer “quality programs.” Yet if the state were to adopt his proposal, we are concerned that faculty would feel pressure to reduce course rigor or inflate grades so as to reduce the number of students who drop classes before the end of the term. Proposed Funding Reallocation Mechanism Could Impair CCC Improvement Efforts. The Governor’s proposal also has a weak justification for redirecting any reduction in a districts’ apportionment funds relating from the shift to course retention to that districts’ Student Success and Support categorical program. In effect, the Governor presupposes that students do not complete their courses because of inadequate assessment or counseling services, but course–retention problems also can stem from a poorly designed or taught class. Yet, if the Governor’s proposal were adopted, the primary funds that support local professional development (apportionments) would be automatically shifted to a categorical program that has an unrelated purpose. Such a redirection of funds actually could serve to undermine a college’s efforts to improve student outcomes. Consider Funding Approach That Supports Access and Success. For all these reasons, we recommend the Legislature reject the Governor’s proposal to change the census date. We believe the Legislature could achieve the overarching objective of improving college and student outcomes by developing a more robust funding model that balances student access (enrollment) with student success (as measured by specific performance indicators). In effect, a disconnect exists today between the state’s message to community colleges and its funding mechanism—value both access and achievement but only get compensated for successfully providing access. We envision a better funding model that continues to place an important emphasis on enrollment and access but also creates stronger incentives for colleges to focus on student achievement by linking a portion of state funding to colleges’ ability to improve outcomes. Building an Effective Funding Model. Currently, a number of other states (such as Pennsylvania, Ohio, and Washington) have adopted funding models that fund colleges for enrollment as well as student achievement. Other states (such as Illinois, Missouri, and South Carolina) adopted such an approach before abandoning it a few years later. Given all of these experiences to date, many best practices and lessons learned have been identified. We believe an effective funding model for the CCC system would include the following components. Specific Outcome Measures. The new system could have program–completion measures (such as graduations and transfers) as well as intermediate measures that influence program completion (such as reaching a certain unit threshold). Rules for Tracking Progress. The new system could measure year–to–year changes for each college. Colleges’ performance could be compared against themselves (rather than other colleges within the system) to account for differences in student demographics among colleges. An Integrated Allocation Mechanism. The new system could allocate a portion of base as well as new funds on performance results. Remaining funding could continue to be allocated based on enrollment. Over time, a larger share of funding could be linked to performance. We believe building this type of funding model would be a significant improvement over both the current system and the Governor’s course–completion funding approach. States’ experiences with more robust outcome–based funding models indicate that such systems can play an important role in focusing institutional efforts on student success. University Funding Model Also Has Basic Problems. The state’s approach to funding the universities also has a number of problems. Historically, the universities’ funding model similarly has emphasized access over success. That is, funding for UC and CSU traditionally has been based largely on the number of full–time equivalent (FTE) students the state expects each segment to enroll, multiplied by an estimated marginal cost per student. The marginal cost formula has been an important way to guide the segments’ student–faculty ratios, faculty salaries, and allocation of resources between research and instruction. Over the last five years, however, a series of unallocated budget reductions and augmentations has disconnected state funding from enrollment. By removing enrollment targets for the universities and delinking base augmentations from enrollment expectations for all three segments, the Governor’s budget effectively funds neither access nor success at the universities. Consider Dual Enrollment and Achievement Funding Model for Universities Too. As the state’s budget stabilizes, the Legislature has an opportunity to establish a new basis for funding UC and CSU that balances access, student outcomes, and other state priorities. For example, instead of basing funding entirely on expected enrollment, the Legislature and Governor also could establish targets for degrees earned, research activity, and cost reductions. When determining funding allocations to each segment, the Legislature could consider the segment’s performance in these areas. In addition, the Legislature could direct the universities to include incentives for improving student achievement (analogous to those described above for CCC) in their internal allocation of state funds across campuses. In these ways, the state could promote both student access and success through its support of the universities. In an effort to expand access to instruction at a lower cost, the Governor’s budget includes several related technology and efficiency proposals. We think these proposals can help place even greater attention on how best to open up new college opportunities. However, as discussed in more detail below, we believe many of the improvements sought by the Governor through these proposals could be accomplished largely within existing resources. Online Education Can Promote Access, Efficiency, and Student Learning. Online education has been found to have numerous benefits, including making coursework more accessible to students who otherwise might not be able to enroll due to restrictive personal or professional obligations and allowing campuses to serve more students without a commensurate need for additional physical infrastructure. Moreover, research suggests that, on average, postsecondary students who complete online courses learn at least as much as those taking the same courses solely through in–person instruction (though students tend to drop online courses at higher rates than face–to–face courses). Recently, massive open online courses (MOOCs) also appear to be paving the way for open–access instruction—often taught by the country’s most distinguished professors—at minimal or no cost to students. Need for New Funding to Create More Courses Is Questionable. We do not see a justification, however, for earmarking $10 million each for UC and CSU and up to $16.9 million at CCC for the development of additional online courses. Each year the state provides funds to UC, CSU, and CCC to support their operational costs. The segments use these monies to pay faculty to develop and deliver instructional content, and campuses generally decide on their own whether that content is offered through face–to–face or online courses. The segments have chosen to use their general–purpose monies to fund a considerable amount of online education. In 2011–12, the CCC system spent approximately $500 million serving over 100,000 FTE students through online education (about 10 percent of total instruction provided that year). Though CSU does not separate out costs by instructional type, online education is commonly used, with each of the segment’s 23 campuses providing such instruction (primarily to undergraduate students). And, while historically UC has offered very little state–supported online instruction, over the past couple of years UC has expanded its online program—with plans to continue adding courses in the near future. Among the three segments, we estimate that more than 20,000 undergraduate courses (and more than 30,000 course sections) were offered online in 2011–12. It is unclear to us, then, why the segments require ongoing augmentations to develop more online courses. Need Does Exist for Segments to Share Existing Online Curriculum With Each Other. While we do not believe additional monies are warranted as proposed by the Governor, we do believe significant opportunities exist for the segments to share more of their current inventory of online courses. Traditionally, faculty that develop curriculum for face–to–face courses do not share it with faculty at other campuses (either within their segment or across the segments). Generally, we find this practice has carried over to online courses at the segments—despite the relative ease with which such coursework can be made available to colleagues. Notably, while CSU and CCC are partners in administering Multimedia Educational Resource for Learning and Online Teaching (MERLOT)—a repository of free online course curricula developed by faculty and researchers throughout the world—faculty from these two segments generally borrow from (rather than contribute to) the collection of online presentations, assignments, tests, and other learning material. This lack of sharing across campuses and segments has several disadvantages, including duplicative spending of state resources (courses can cost tens of thousands of dollars each to develop) and forgone opportunities to share thoughtful coursework with other educators. Recommend Using Competitive Grants to Build Repository of Online Courses. A more cost–effective approach than the Governor’s would be for faculty to make their content available to colleagues for reuse. To facilitate sharing, we recommend the Legislature provide one of the segments with a small portion of one–time funding to administer a competitive grant program that would provide grants to faculty (from any of the segments) to modify, as needed, their existing online curricula (or, to the extent a need is identified by the Academic Senates of the three segments, to create a new online course). To assure quality, courses would be reviewed by other faculty in the field. As a condition of receiving the grant monies, faculty would agree to make the learning materials available on MERLOT. (The intellectual property rights would remain with the original developer.) These online materials would be available to all of the state’s educational segments—including K–12 teachers who may wish to adapt the coursework for their Advanced Placement or precollegiate courses. Assuming an average grant amount of $20,000, a $1 million augmentation would fund the modification or development of 50 open online courses. Such an approach would result in a large number of online courses becoming available to students and faculty throughout the state. Opportunities Exist to Create Streamlined Online Student Pathways. As part of his online initiative, the Governor also has expressed an interest in increasing opportunities for students to enroll in online courses offered at other campuses, though he does not provide the segments with specific direction as to how to achieve this goal. We agree with the Governor that the state should address this issue, as the current cross–campus enrollment process is disjointed and overly cumbersome for students. For years, the state has funded California Virtual Campus (CVC), a website featuring a catalog of online courses offered by CCC, CSU, and UC, as well as by various private colleges and universities. While CVC can be helpful, its utility is limited. For example, CCC students who identify a course of interest at another college in the system have to apply for admission at that college, receive a new student identification number and password, and register for the class. Students also are responsible for transferring credits earned from the course back to the home campus (typically by petitioning an academic counselor). Community college students interested in transferring to CSU can face even more difficulties, as they must navigate among CSU’s degree requirements, CVC’s online catalog, and potentially numerous campus registration websites. Recommend the Segments Report on Cross–Campus Enrollment Projects. A more convenient system would allow students to plan their education using a single website, enroll directly in online classes they need, and immediately determine whether the course is accepted for credit at the home campus. Currently, all three segments are investigating new systems to facilitate a more streamlined process of cross–campus enrollment in online courses. A joint project involving CSU East Bay, CVC, and several community colleges in the San Francisco Bay Area is seeking to improve this process for students who are attending college online. This project—the California Online Program Planner—would allow transfer–seeking CCC students to select an online program at CSU East Bay and identify (1) what courses they will need to earn the degree (lower–division courses at CCC and upper–division courses at CSU) as well as (2) participating pilot campuses where transferable courses are offered (and whether a seat is available). Students then would be able to register for these courses from one website (using the same identification number and password) and “check off” their academic progress against degree requirements as they successfully complete their courses. The intent is to eventually expand beyond the handful of participants in the pilot project and include other CCC and CSU campuses throughout the state. The UC also is studying the possibility of a “cross–campus hub” that could include UC as well as non–UC students. To better assess the potential of these projects for streamlining online pathways, we recommend the Legislature request CVC and the three segments to provide updates at spring budget hearings on their implementation plans and estimated costs. Proposes to Fund Common LMS for All Colleges to Use. As part of his CCC technology initiative, the Governor proposes using some of the new $16.9 million to purchase a common LMS for the entire CCC system. Though a precise amount had not been provided by the administration at the time this report was being prepared, the CCC Chancellor’s Office estimates the annual cost would be about $10 million, with an additional one–time up–front cost of about $2 million. A LMS allows faculty to post information about a course (such as the syllabus), instructional content (such as video presentations), assignments, and other material. Students use the LMS to perform functions such as submitting their assignments, taking tests, and participating in online discussions with classmates. Several vendors create and sell these systems and community colleges currently decide on their own which LMS to use. Colleges typically use apportionments (general–purpose monies) to acquire the software. By purchasing centrally and making the LMS available to community colleges at no cost, the Governor anticipates that colleges would discontinue use of their current LMS format (assuming it is different from the LMS that is selected) and use their freed–up monies for other purposes. To the extent colleges adopted the same LMS, students across the CCC system would no longer have to spend time learning to navigate different LMSs. Recommend CCC Adopt Common LMS Using Existing Funding. We agree that a common LMS would have some benefit to students who take courses at more than one college. A common LMS also could make sharing digital instructional content among colleges easier. We do not believe however that a funding augmentation for this purpose is necessary. By purchasing their LMS on an individual basis, colleges pay much more than they would if they were to buy “in bulk” from one vendor and divide the total cost of the LMS among themselves. In fact, the Chancellor’s Office estimates that colleges could save on average roughly $100,000 each per year if they were to leverage economies of scale in this way. We recommend the Legislature direct the Chancellor’s Office to report this spring at budget hearings on opportunities for community colleges to collaborate in such a manner, including the role the Chancellor’s Office might play in facilitating the procurement of a common systemwide LMS using community colleges’ existing funding. “Challenge Tests” Provide an Alternative Way for Students to Earn CCC Credit. In an attempt to create greater efficiencies, the Governor also seeks to increase the number of students who can earn CCC credit for prior learning. Typically, students earn CCC credit by enrolling in courses, completing required coursework, and receiving a passing grade. Community college regulations, however, allow for students to obtain course credit using an alternative method. Specifically, districts may grant course credit to students who—despite never taking the course—pass a challenge test. (The resulting CCC credit is known as credit by examination.) By allowing students to earn credit for material they learned through self–study or other experiences, colleges can help students accelerate their time to a degree. Important Issue to Raise but Legislature Needs More Details on Governor’s Proposal. Like the Governor, we believe opportunities exist to expand the usage of credit by examination and improve certain students’ time to degree. This is particularly true given the many opportunities today for individuals to acquire knowledge and skills outside the traditional collegiate environment, including students who enroll in MOOCs and veterans returning to civilian life having learned material that is comparable to the content in CCC courses (such as in electronics, computer programming, and various health care fields). To date, however, the Governor had not provided any detail on his proposal to expand credit–by–examination options and what he is requesting the Legislature specifically to do remains unclear. We thus withhold recommendation pending additional information from the administration. As the Legislature considers funding and tuition levels each budget cycle, it grapples with the share of cost to be borne by the state and students. As part of his budget package, the Governor has several proposals relating to share–of–cost issues. As discussed in more detail below, we have serious concerns with the Governor’s tuition freeze proposal, as it very likely would result in steep tuition increases during the next economic downturn and reduced accountability in the near term. In contrast, we recommend the Legislature adopt some variant of the Governor’s unit–cap proposal, as we believe it would create positive incentives for both students and the segments. We also recommend the Legislature adopt the Governor’s two CCC financial aid proposals. 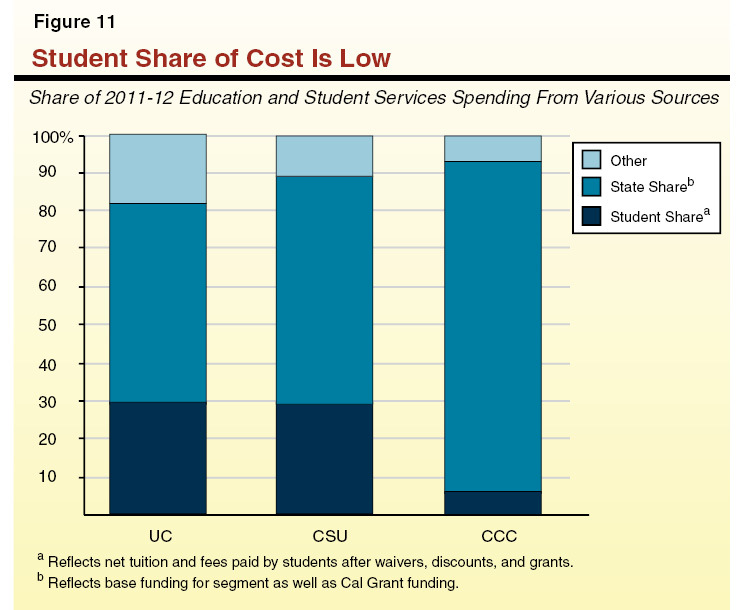 Current Student Share of Cost Relatively Low. The full tuition level currently reflects about 55 percent of education costs at UC, 46 percent at CSU, and 24 percent at CCC. Because of financial aid, however, fewer than half of students pay the full tuition rate. After accounting for state and institutional financial aid, the average net amount paid by students currently covers about 30 percent of education–related spending at the universities and 6 percent at the community colleges, as shown in Figure 11. (When federal and private grants are included, the student shares are even lower.) These shares are very low compared with other states. Governor’s Proposal to Freeze Tuition Levels Likely Would Have Negative Long–and Near–Term Consequences. The Governor’s proposal would extend for four more years UC and CSU tuition levels that already have been in place for two years. While this would help current students, it likely would increase volatility for future students. 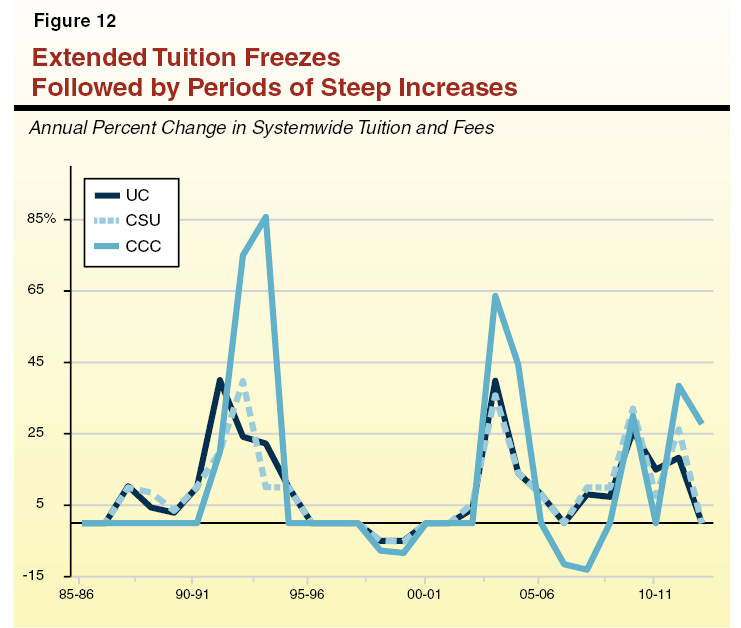 As shown in Figure 12, extended tuition freezes at California’s public institutions have been followed by periods of high annual tuition increases. The proposal also would have the negative near–term effect of reducing the incentive students and their families have to hold higher education institutions accountable for keeping costs low and maintaining quality. Given the important role of tuition in higher education budgets, a relatively low share of cost now borne by students and their families, and likely negative consequences of an extended tuition freeze, we do not see a strong justification for having the state bear all higher education cost increases for the next four years. Recommend Share–of–Cost Fee Policy. For these reasons, we do not think an extended tuition freeze would be in the public’s best longer–term interests. Instead of an extended tuition freeze, we recommend the Legislature adopt a policy that bases tuition and fee charges at each of the public higher education segments on a share of educational costs. Such a policy would provide a rational basis for fee levels and a simple mechanism for annually adjusting them. It would recognize explicitly the partnership between students and the public. It also would strengthen accountability by giving students and their families an incentive to hold institutions accountable for keeping costs low and maintaining quality. Though such a policy would depend on the state providing its share of funding, we believe it would be more likely than the Governor’s proposal to result in moderate, gradual, and predictable tuition increases over time. Proposal Creates Positive Incentives for Students . . . If they work as intended, caps on state–subsidized units encourage students to seek academic advising and develop academic plans in their first year of college. Unit caps also discourage repeated changes of major and other student choices that result in excess unit–taking yet still providing some room for students to explore other subjects and add new skills. By promoting more efficient course–taking, unit caps likely would reduce costs and improve on–time graduation rates.
. . . Also Could Improve Institutional Practices. In addition to encouraging efficient student choices, unit caps could improve campus practices that contribute to excess unit–taking. The proposed policy would create pressure for campuses to enhance academic advising and ensure availability of required courses. It also would focus attention on course articulation (the formal recognition of specified courses at one institution to meet equivalent course and program requirements at another institution). Campuses also would need to track student progress toward degrees under the proposed policy, providing valuable information for course scheduling as well as student advising. Recommend Adopting Unit–Cap Policy. Because it creates positive incentives for students and motivates institutions to improve the efficiency of their academic programs, we recommend the Legislature adopt a cap on the number of state–subsidized units students can accrue. As discussed in the nearby box, a unit–cap policy would complement existing institutional efforts to improve academic efficiency. The Governor’s unit–cap proposal is vague, however, and needs to be further developed. The administration has provided a few details as to which types of courses would be excluded from the cap and how the cap would be applied across the segments but leaves out numerous details that typically are included in unit–cap policies. The proposed unit cap would complement the following existing efforts to improve on–time graduation rates. New California Community College (CCC) Regulations. In recent years, the CCC Board of Governors (BOG) has adopted several new regulations intended to reduce excess course–taking by students. In July 2011, the BOG approved a regulation that limits the number of times community colleges are eligible to receive state support for students who fail to pass a course (or enroll but then drop the course). In July 2012, the BOG adopted another regulation that prohibits community colleges from receiving state support for student re–enrollments in certain “activity” courses (such as physical education). The BOG also has adopted a regulation that establishes a systemwide enrollment policy. Under the new regulation, which goes into effect in fall 2014, community colleges are no longer permitted to give enrollment priority to students who have accumulated 100 or more degree–applicable CCC units. Various California State University (CSU) Initiatives. The CSU campuses have adopted numerous strategies to improve course availability. These include block scheduling (assigning a fixed course schedule to entering freshmen) and “four–year pledge programs” (which guarantee to full–time students who follow a specified academic plan that they will be able to get the necessary classes to complete a degree within four years). In January 2013, the CSU Board of Trustees also adopted a policy capping the number of units that campus programs may require for a bachelor’s degree to 120, with limited exceptions. (Currently about 20 percent of CSU bachelor’s degree programs require more than 120 units.) While required units above 120 would not be considered excess units, capping degree requirements achieves a similar objective as the excess unit policy—it reduces student and state costs to complete an academic program and makes room for additional students at CSU. In addition, last fall, CSU administration proposed three new incentive fees to be assessed on (1) excess units (similar to the Governor’s proposal), (2) high unit load in a given term, and (3) course repeats. Discussion of these three proposals has been deferred to a future board meeting, but all three proposals would reduce excess unit–taking by students. Joint CCC–CSU Transfer Initiative. In 2010, the Legislature adopted Chapter 428, Statutes of 2010 (SB 1440, Padilla), to improve the efficiency of transfer from CCC to CSU. The legislation requires community colleges to create two–year (60 unit) degrees (known as “associate degrees for transfer”) that are fully transferrable to CSU. A student who earns such a degree is automatically eligible to transfer to the CSU system as an upper–division (junior) student in a bachelor’s degree program. Though these students are not guaranteed admission to a particular CSU campus or into a particular degree program, SB 1440 gives them priority admission to a CSU program that is “similar” to the student’s CCC major or area of emphasis, as determined by the CSU campus to which the student is admitted. Once admitted, SB 1440 students need only to complete two additional years (60 units) of coursework to earn a bachelor’s degree. By guaranteeing full credit for courses taken at the CCC and limiting the number of additional units students may be required to complete, this legislation also reduces excess unit–taking. Credits Earned Through Other Agencies. The Governor’s proposal would exclude from the cap credits earned for Advanced Placement and other courses students complete for college credit while they are in high school. The proposal, however, does not address credits earned through other types of external validation (such as programs coordinated by the Department of Defense to help active duty and veteran students earn credit for prior learning) or standardized exams (such as the College Board’s College Level Examination Program and the national licensing exam for nurses). Credits Earned by Evaluation. In addition to relying on external agencies, colleges and universities award credit within their departments by evaluating students’ mastery of subjects through various types of assessments including challenge exams, portfolios, and skills demonstrations. While credits awarded by evaluation count toward meeting degree requirements, they are excluded from the calculation of FTE students. It is unclear whether these units count toward the caps under the Governor’s proposal. Prior Unsubsidized Courses. The Legislature also will need to decide whether to exclude from the caps any units not paid by the state, such as those transferred from unsubsidized extension programs and private and out–of–state colleges. Higher Unit Requirements for Double Majors. The Governor’s proposal is unclear as to whether additional requirements for a student to complete a double major would count toward the cap. Although double majors have increased course requirements, they typically can be completed within 125 percent of the units required for one major because several courses may count as electives for both majors. Courses Attempted but Not Completed. The Legislature also may wish to consider how to treat courses attempted but not completed for credit. These include courses that students fail or drop. Because students often repeat failed and dropped courses—sometimes over and over—they contribute to excess course–taking. The Governor’s proposal excludes these courses. Case–by–Case Waivers. The Governor’s proposal authorizes the governing board of each segment to approve waivers on a case–by–case basis for students who exceed the cap “due to factors beyond their control.” (The Governor cites lack of access to required courses as one example of a factor beyond a student’s control.) The Legislature may wish to weigh in on the general types of factors that may justify a waiver. Recommend Adopting Certain Provisions Not in Governor’s Proposal. Given all these considerations, we recommend the Legislature adopt three specific provisions as part of a unit–cap policy that would encourage efficient student choices while protecting students from undue penalties. We recommend excluding from the caps units earned through other agencies, by internal evaluation, and for unsubsidized courses as long as they do not contribute to FTE student counts. Units earned in these ways reduce costs for students and the state on the natural. Including them in unit caps could create a disincentive for students to use these approaches for fear of accumulating too many units. We also recommend that students not be allowed additional state–subsidized units for double majors. This would encourage students to use their electives efficiently while still allowing students to expand their academic horizons. We further recommend a cap on the number of failed and dropped courses the state subsidizes. Lastly, we recommend providing additional guidance regarding waivers. We think the vagueness of the waiver criteria could result in an excessive number of appeals and weaken the unit–cap policy. For example, students might claim that they took excess units because they could not get into required courses. Given the difficulty of retroactively assessing whether required courses could have been taken on time, we recommend a policy requiring up–front verification that required courses are unavailable. This would ensure that students seek advising if they are having difficulty enrolling in courses, increasing the likelihood of finding solutions for many students, and avoiding numerous appeals. Recommend Implementation in 2015–16. Instead of implementing the unit caps in 2013–14, we recommend the Legislature delay implementation for two years to (1) provide adequate notice to students and (2) permit the segments to develop systems to identify and monitor excess units as students enroll. With adequate notice, the phase–in beginning with 150 percent of required units for UC and CSU students would be unnecessary. Current students and new students entering after enactment would have sufficient time to develop and adjust their academic plans to graduate within the tighter unit limit. Accordingly, we recommend forgoing the Governor’s proposed unit caps for 2013–14 and 2014–15 but implementing his proposed caps for 2015–16 and thereafter. Recommend the Legislature Approve Proposed Changes to FAFSA and CCC Fee Waiver. As noted earlier, certain community college students currently can apply for a BOG fee waiver using either a FAFSA or separate BOG form. We agree with the Governor that allowing students to complete only the BOG form works at cross–purposes with both student and state interests. We thus recommend the Legislature approve the Governor’s FAFSA proposal. (While undocumented immigrants are not eligible to submit a FAFSA, CSAC has recently developed a new FAFSA–like form so that financially needy students covered under the Dream Act can be considered for the full range of state financial aid funds, including BOG fee waivers and Cal Grants.) In addition, we recommend the Legislature approve the Governor’s proposal to require CCC to count dependent students’ income for purposes of determining eligibility for a BOG fee waiver. This would bring CCC policy in line with federal financial aid policy for dependent students, which includes both the parents’ and students’ income for purposes of determining financial need. Unallocated Base Increases. Reject the Governor’s approach to base increases. Fund obligations (including debt service, employee pension costs, and deferral pay downs) as a first priority. If more funding is provided, link with specific expectations. Enrollment Targets. Set enrollment targets for all three segments to ensure that improvements in student outcomes do not come at the expense of existing student access. Combining Universities’ Capital and Support Budgets. Reject Governor’s proposal. Restructuring Universities’ Debt. Reject Governor’s proposal. Universities’ Retirement Costs. Adopt Governor’s proposal to lock in current base for CSU retirement costs. For UC, designate $67 million of base increase for retirement costs. For Hastings College of the Law, increase base augmentation from $392,000 to $455,000 and designate for retirement costs. Adopt budget language specifying the state is not obligated to provide additional funding for UC and Hastings. CCC Funding Reform. Reject the Governor’s proposal to fund community colleges based on course completions. Consider an alternative funding approach that balances student access with student success. Online Education. Reject the Governor’s proposals to provide $10 million each to UC and CSU and up to $16.9 million to CCC for the development of new online courses. Instead, provide one segment with a small amount of one–time funding (such as $1 million) to provide competitive grants to faculty who modify their existing online courses (or, as needed, create new online courses) and share the courses among all three segments as well as K–12 faculty. Further recommend the Legislature request the three segments to provide updates at spring hearings on their plans to implement cross–campus enrollment processes for online students. Common Learning Management System (LMS). Recommend the Legislature encourage CCC to adopt a common LMS using existing resources. Credit by Examination. Withhold recommendation on the Governor’s proposal to expand opportunities for students to earn credit by examination pending further information. Tuition. Reject proposal for extended tuition freeze at the universities. Adopt share–of–cost fee policy. Caps on State–Subsidized Units. Modify Governor’s proposal to exclude certain types of credits earned and provide additional guidance regarding waivers. Provide no special treatment for double majors. Allow two–year implementation lag. CCC Board of Governors (BOG) Fee Waiver Program. Approve the Governor’s proposals to require students to (1) complete a federal financial aid application to obtain a BOG fee waiver and (2) count dependent students’ income for purposes of determining eligibility for the BOG fee waiver. Faculty Recruitment and Retention at the University of California (December 2012). Examines recent trends in faculty recruitment, retention, and compensation at the university. Discusses implications of recent trends for state budget decisions. Improving Higher Education Oversight (January 2012). Presents a conceptual model of how the state can improve higher education oversight and provides specific short–term and long–term recommendations. The Master Plan at 50: Improving State Oversight of Academic Expansions (December 2009). Evaluates the efficacy of the state’s approval process for new programs and schools at the state’s public universities and colleges. The Master Plan at 50: Using Distance Education to Increase College Access and Efficiency (October 2010). Provides an overview of online education—including its prevalence, data on learning outcomes, and funding—as well recommendations to improve state oversight and overall program efficiency and effectiveness at UC, CSU, and CCC. Public Pension and Retiree Health Benefits: An Initial Response To the Governor’s Proposal (November 2011). Provides background on the state’s retirement policy issues and our initial response to the Governor’s 12–point plan to change pension and retiree health benefits. Reforming the State’s Transfer Process: A Progress Report on Senate Bill 1440 (May 2012). Discusses SB 1440 (Padilla), which was enacted in 2010 with the intent to fundamentally reform the transfer process between CCC and CSU. Provides an overview of key issues and concepts pertaining to transfer education, assesses each segment’s progress to date in implementing the legislation, and makes recommendations designed to ensure that CCC and CSU stay on track and meet the Legislature’s intent. Restructuring California’s Adult Education System (December 2012). Contains background on adult education in California, identifies five major problems with the current system, and provides a package of recommendations for improving the state’s adult education system. “Rethinking the Community College Fee Waiver Program to Better Promote Student Success and Assess Need,” in The 2012–13 Budget: Analysis of the Governor’s Higher Education Proposal (February 2012). Reviews the CCC Board of Governors fee waiver program and identifies several opportunities to change the program in ways that promote student achievement while ensuring that state resources are targeted to actual student need. A Ten–Year Perspective: California Infrastructure Spending (August 2011). Examines recent trends in state infrastructure spending (including for higher education) and discusses issues for the Legislature to consider moving forward.